Astronomy Science ~ In the search for planets that support life, we must first select the appropriate parent star. There are many factors that will make the star system too hostile for life even to start. So what kind of star that can provide the perfect conditions for a habitable planet elsewhere in the universe? The earliest evidence of life known on Earth originated about 3.5 billion years ago, about one billion years after the formation of our planet. Life may have existed before, but we could use this date as a first estimate of the amount of time necessary for life to look for traces in other stars. This immediately gives us a criterion that can reduce our target to look for life. If the planet have too young parent stars - even if the planet seemed perfect for life - it will not have time for life to develop. Too large Star will have only fast life. The life of a star is approximately inversely proportional to the square of its mass. So which star has a mass ten times larger than our sun will live only 1/1000 of the age of our sun. Estimate of our sun will have more than 10 billion years, so the super star with a mass ten times the mass of our sun would live only 10 million years. It was too short for life to thrive and grow in one of the planets orbiting the super star. So the most massive stars will live and die too fast to be a good target in the search for life. The size of the star is best to look for and the development of life is a star-sized one and a half times the mass of the sun. It set limits on the mass of our targets. The smaller star, it will be less hot and less luminous. To illustrate this, we can see the Proxima Centauri. Proxima has a mass only about 1/8 the mass of our sun. Although close, the star is too faint to be seen with the eyes. Brightness is less than dwarf star, this means that they must be orbiting planets closer to livable. However, if you move a planet close enough to its star, the planet will be trapped - known as tidally locked - make one face of the planet always faces its parent star, like the moon and Earth. Whether life can thrive and grow in a locked planet is still a subject of debate. We certainly can not rule out life in such an environment, especially since there are scenarios that allow the planet to continue to revolve around the parent star (Mercury trapped in our solar system, rotates only three times on its axis at each of two rounds around the sun). Such scenarios would help ensure that the planet is not too hot on one side than the other side, but this is certainly a target less than ideal. Like our sun, a star known to have a magnetic activity - visible through sun spots and flares - and emits a wind of plasma particles constantly into their environment (such as the solar wind). Although the sun could be very active with solar flares that can overload the power grid and telecommunication system damage, this behavior is not nothing compared to the activity observed on other stars. Little stars often look quite ferocious, some of them show major flare activity. This reinforces our conclusion that little star is not ideal be the first place to look for habitable planets. Beyond all of this, it is known that the young star is usually much more active than the older, illuminating planets orbiting them with a strong stellar wind. Again, is not a place that is conducive to the development of life, because of the strong winds from these stars can eliminate the atmosphere of a planet and the high energy radiation contained in or extinguish the flares can damage the newly formed life. The host star, the most ideal for a habitable planet is a solitary star consisting of one star, unaccompanied binary and not surrounded by too many other stars in a cluster. Binary star will make a picture of the planet in the system is very different from what is seen on Earth. 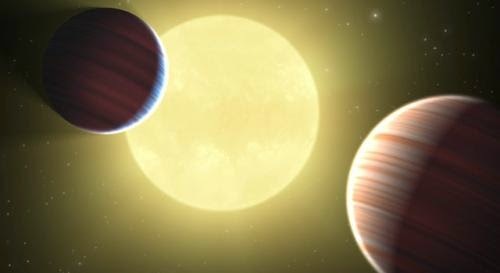 In recent years, a number of planets have been discovered orbiting stably in a binary star system, both orbiting one star in the binary apart, or orbiting the second star in a close binary. It is clearly a possibility that life could have evolved and grown. But, once again, their situation is very different from the system of planets like Earth and it seems this is not our first place to look for habitable planets.